Kakabeka Falls or the Niagara of the North, in Kakabeka Falls Provincial Park in Ontario, Canada, has a mass of water flowing over the rock ledges during a spring flood creating an incredible show for visitors to the area. As the waterfall thunders 131 feet to the pool below in the Kaministiquia River, the mist rises above the deep canyon walls forming a beautiful rainbow in the sunlight. 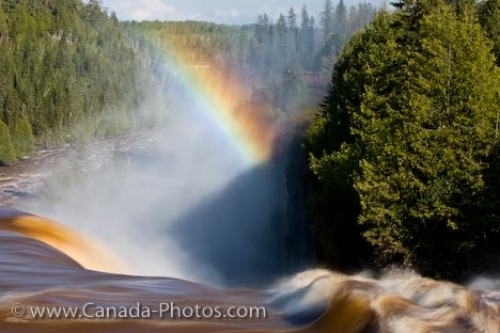 Picture of the mist above the pool at the base of Kakabeka Falls in Thunder Bay, Ontario as a rainbow arcs over the waterfall.